Solar System fans, space shuttles are not the only way you can visit a planet! 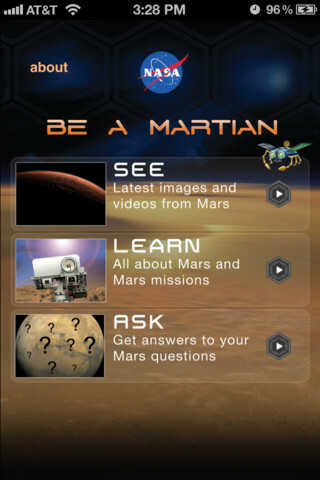 In July 2012, the Jet Propulsion Laboratory at NASA developed a mobile app called “NASA Be A Martian”, which allows you to become a Martian citizen on planet Mars. A Martian citizen can explore images, videos and animations on an iOS, Android or Windows mobile device. The images, videos and animations deliver an epic view of the rocky terrestrial planet, known as the Red Planet. The photography and videography on the “NASA Be A Martian” mobile app, makes the user feel like he or she has experienced a mission to Mars. Mars is the fourth planet from the Sun and is the second smallest planet in the Solar System. If mobile app users would like to learn more about Mars, they can generate questions via the mobile app. Not to mention, users can learn more about Mars’ channels, dunes, valleys, landslides and gullies by viewing the “Mars as Art” section of the mobile app. Overall, the “NASA Be A Martian” mobile app is very informative, user friendly and entertaining. Don’t forget to download this free mobile app and others like it in the USA.gov Apps Gallery.